Looking for a Short Break. Then look no further. Lots of the accommodation properties are happy to offer Short Breaks or themed packages to allow you that rest and relaxation in your busy lives. Contact the providers directly to check availability and prices. Amber Valley has a wide variety of venues to choose from when it comes to finding that perfect backdrop for your wedding, or facilities for your conference. Derbyshire offers some beautiful and unique venues, all surrounded by countryside yet within easy reach of towns and cities. Choose from large conference centres with all the modern facilities you'd expect, or a venue with real historic character for a spectacular day to remember your wedding. Amber Valley is a great place to do business or enjoy a wedding with the great road and rails transport links and airports nearby. 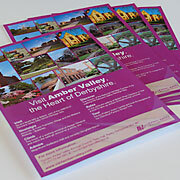 Looking for accommodation in Derbyshire? Search for hotels, bed and breakfasts and self-catering properties in the area to suit all budgets and tastes.